Attractive multi-color display of flowers will bloom from spring through fall. A mixture of annual, biennial, and perennial wildflowers with about 16% blooming in the spring, 90% throughout the summer, and 40% into the fall. Colors will include Yellow, Red, Purple, White, Lavender, and Pink. Height will range from 12 to 48 inches. 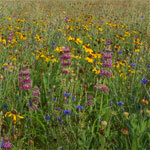 Tall native grasses like Indiangrass, Big bluestem, Canada Wildrye, and Little bluestem will add nice texture and habitat value to a Prairie Wildflower planting. Perennial Mix. Approximately 208,000 pure live seeds per pound. Seeding rate: 3 to 6 oz./1,000 sq. ft., or 8 -14 lbs./acre. Mixture includes: Blackeyed Susan, Blue Flax, Blue Cornflower, Dames Rocket, Dwaf Red Plains Coreopsis, Ox-Eye Sunflower, Grahyead Coneflower, Lance-Leaved Coreopsis, Lemon Mint, Mexican Red Hat, New England Aster, Partridge Pea, Perennial Lupine, Purple Coneflower, Purple Prairieclover, Red Yarrow, Shasta Daisy, Spiked Gayfeather, Prairie Coneflower, Perennial Gaillardia, Annual Gaillardia, and White Yarrow.